Accessibility. It’s a word we hear often but may not all share the same definition of. To us, accessibility means offering equitable opportunities for people living with developmental disabilities to make their own way. It means making barrier free communities by improving disability supports and services. At posAbilities, inclusivity is the grease that keeps our wheels turning. We are devoted to promoting a stronger awareness to the ongoing journey of accessibility. This also happens to be the 2018 theme for Community Inclusion Month. For the month of October, citizens were encouraged to celebrate the strengths, rights and contributions of people living with developmental and intellectual disabilities. This year’s theme is ‘Accessibility Includes’. This is in light of the proposed new Bill C-81 which is a part of the Accessible Canada Act. 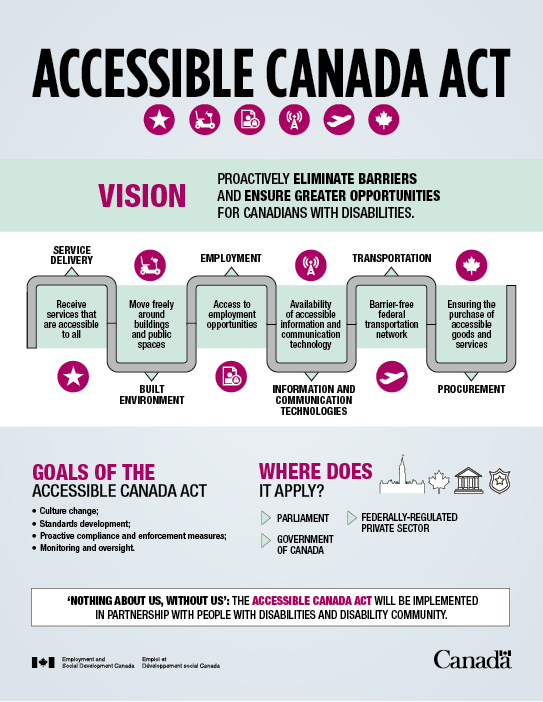 If passed, this Bill would help ensure a barrier free Canada, and benefit Canadians living with disabilities by removing the physical barriers that prevent people from contributing fully to community life. posAbilities celebrated Community Inclusion Month through our various services and programs. Most notably, we promoted inclusion and accessibility through our arts, employment, and innovation service streams. Last month, on Lansdowne and No. 3 roads in Richmond, a little mural magic ensued. posAbilities’ team members and persons served sparked a full blown mural mob! “Richmond through the Ages” is a community mural depicting what Richmond was and has grown into. Irena Flego from the Richmond Social Network, spoke to the importance of this event, stating, “The main purpose is community inclusion … It’s about doing something meaningful together.” Apart from the people of posAbilities, this tenacious team of painters included commissioned artist Bobae Kim, international students from Kwantlen University, community RCPM officers, and other curious passer byes who wanted to get in on the action. Through the power of art, conversations, connections, and relationships were inspired that day. This was a newsworthy event. In fact, the Richmond News stopped by to get the full story which you can read here. On Thursday, October 11th, we hosted our 14th annual INCLUSION Art Show & Sale at Heritage Hall in Vancouver. As the largest disability art show in BC, we proudly hosted another successful event, presenting stunning creations from over 150 artists with diverse abilities. Through our exhibition, we gave talented individuals a platform to share their gifts with others and to connect with fellow art lovers over their passion. The INCLUSION Art Show & Sale contributes to Community Inclusion Month every year by bringing together several art studios and independent artists and opening our doors to the community so that together, we can break down social barriers, and reduce the isolation that many artists with disabilities face. From pottery to paintings, jewelry to glassworks, and more, there was truly something eye-catching for everyone who attended. To take a look back on our past shows, head on over to www.inclusionartshow.com. On October 19th, our very own James Miller of posAbilities Employment Services (PES) was invited to The Lynda Steele Show on CKNW News. James spoke alongside two other guests, the owner of el Santo Mexican restaurant, Alejandro Diaz, and Diego, one of his employees who shares that he is on the autism spectrum. October is also autism awareness and acceptance month, and it’s estimated that currently 70-90% of people living with autism are unemployed. Diego was hired by Alejandro through posAbilities Employment Services. His passion for food and cooking led him to his current position as an assistant cook. With help from the PES team, a mutually beneficial employment connection was made. James described how Employment Specialists sat down with 26-year-old Diego and identified his interests, unique skills and abilities, and what supports he would need in order to thrive in the workforce. PES not only prepares persons with disabilities for rewarding careers, but also provides them with on the job coaching. A big part of what they do involves breaking down stereotypes and myths, and showing employers that persons with disabilities can offer valuable skills to their businesses. You can listen to the full podcast here. Last month, we had the pleasure of being featured in The McConnell Foundation’s series ‘Catalyst’ which documents how social innovations are creating positive social change. Community members often have common misperceptions about people with disabilities. Find out how we are working to erase stigma, and support more meaningful lives for not only people with developmental disabilities, but everyone. Learn how we are retrofitting social services for greater inclusion and read the full article here.